LTHOUGH SELDOM SEEN in cultivation, Aechmea veitchii is a colorful bromeliad and worthy of a place in collections. A stoloniferous plant, about three feet in height, its 12 to 17 leaves form a loose-leaf cyathiform rosette. The glabrous leaves are pale green with spots of dark green. The colorful flowerhead rises above its cluster of leaves; the white flowers tipped with scarlet are borne on a spike densely clothed with bright-red toothed bracts, closely investing the flowers. Aechmea veitchii is to be found growing in Costa Rica, Panama, Colombia, and Peru in thick high forests, usually at altitudes ranging from 1250 to 2100 meters. Mulford Foster, however, found it growing at sea level near Buenaventura, Colombia. Aechmea veitchii was so named by Baker in 1877, although a year later it was called Chevalliera veitchii by E. Morren in La Belgique Horticole. The above photographs were taken by Marcel Lecoufle of a plant in his collection. was in Mexico for the first time in 1958. I had gone there to build up a sales-and service-station for a German business firm. 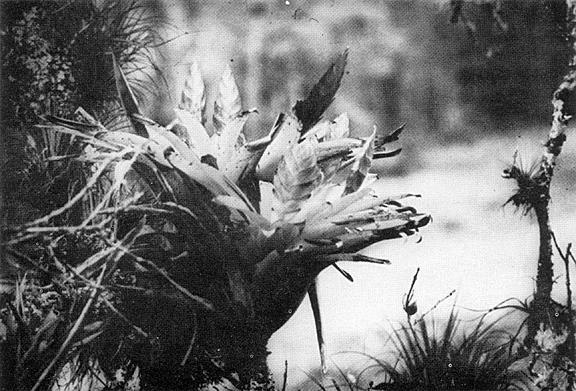 In those early days my knowledge concerning bromeliads was limited to the Aechmeas and Vrieseas commonly displayed in flower shops in the Old Country. The two years following I traveled widely all over Mexico and had a chance to become familiar with many sections of the country, especially in the southern tip, where a wealth of interesting specimens delight the plant enthusiast. My travel took me to many out-of-the-way nooks and niches never before seen by a foreigner nor by most Mexicans themselves. When I showed my Mexican color slides to a group of friends at home in Germany in the fall of 1965, it turned out that most of the bromeliads and orchids in my pictures were unknown or considered to be very rare. Inquiries at the local university proved we were right, and as several botanic gardens showed a deep interest in the plants. I decided to make a collecting tour to the area on the boundary of Mexico and Guatemala starting February 1966. I arrived in Mexico City in mid-February. Unable to find a jeep on such short notice, I rented a Volkswagen and set off immediately to the south. On the road to Puebla, only a few kilometers from the Capital, at an altitude of 3,000 meters, I found Tillandsia macdougallii flowering in ancient pine trees and a little further on Tillandsia andrieuxii in a small oak grove off the road. My trip was not to exceed three weeks and as I had to drive some distance to get to my destination I did little collecting along the Pan-American Highway where few or no new species were likely to be found anyway. But along the highway I did see T. schiedeana minor and major, T. juncea, both the thickly white-scaled form and the green one, T. ionantha, T. concolor, T. dasyliriifolia, T. polystachia, T. plumosa, T. caput-medusae, and T. atroviridipetala. The real collecting activities were planned for the area around Tuxtla Gutierrez. I knew a site of T. ionantha var. van Hyningii in that region and intended to collect specimens. The plants grow on the steep slopes that border the Rio Chiapas at the exit of the Sumidero Canyon where vertical rock walls, rising to 400 meters in places, cover a distance of several kilometers. T. ionantha var. van Hyningii clings to its perpendicular hold in clusters a few meters wide. I had hoped to collect enough plants for my needs with the help of natives, but not one was willing to help me because nine people had lost their lives within the last few years trying to climb these walls. The plants could not be reached from above, but I spotted a few cushions farther down, about 10 meters above the water. I managed to get about 150 of these clumps on my way back, using a raft, bamboo ladders, and poles. In a secluded spot of the gorge I found T. flabellata growing under a dense roof of Monstera deliciosa. Both the red and the green form of this Tillandsia grow together, mingled one with the other, making it evident that the different coloring is not due in this case to more or less light. In sunnier places grow Hechtias, Pitcairnia heterophylla, great masses of T. schiedeana, the hazelnut-shaped T. ionantha, and another little bromel with conspicuous, shiny dark leaves; un fortunately, it was out of reach. Left � T. macdougallii has a bright pink inflorescence. Below � T. multicaulis can have from 2 to 7 bright orange flower heads. From Tuxtla, altitude about 500 meters, I drove up the Monte again, towards San Cristobal de las Casas. One does well to avoid this road after six o'clock in the evening. At this hour fog coming up from the lowlands reduces vision to but a few meters. San Cristobal is the center for many of the Indians living in the south. An assembly of Chamulas, Zinacantecos, and Coyotes on market day, all in their picturesque tribal attire, is an unforgettable sight. Between San Cristobal and Comit�n the road climbs to nearly 2000 meters for about 100 kilometers. Beautiful orchids and Tillandsias grow in the area, but I was eager to get to the lakes of Montebello, 70 kilometers south of Comit�n. In. 1959 I had tried in vain to see the Seven Lakes, renowned for their varying tints from pale to dark green, from turquoise and pale-blue to dark-blue. That had been in December, only two months after the rains, and my car got stuck in the mud. The road was in better condition this time, but the last ten kilometers had to be done on foot. The lakes are surprisingly beautiful and the plants around most interesting. I found a begonia with a spike almost two meters high, many marvelous orchids, incredibly large clusters of T. usneoides, a funnel-shaped bromel with broad dark-red leaves, 80 cm. in diameter, that is often inhabited by small snakes, and Sobralia macrantha high in the trees. I saw, however, very few Tillandsias of interest. On my way to the lakes I had an Indian with me who knew enough Spanish to understand what I explained to him about my trip and what I wanted. He told me about his native village north of Comit�n and said that many orchids and maguesysitas (bromels) grow around two small lakes not far away from it, that nobody goes there after such crazy things, but that his brother would most likely be pleased to help me. Thus I went to Ococingo, about 100 kilometers north of Comit�n, on a road that often vanished from sight for considerable length. Sometimes I feared that the car might break down and leave me stranded and lost in the Monte. But I went on despite slow progress, sometimes not more than five kilometers in an hour. I even found the brother, and together we started on horseback into the mountains. On the first night we stopped in an Indian village of about 100 inhabitants. For supper we had chipincle (armadillo) and other strange things to eat, but a couple of drinks of tequila made a tasty meal of it all. The night spent in a hammock was long and cold, but the next day made up for all the discomfort. We came to a small lake surrounded by trees loaded with bromels: T. lampropoda, T. multicaulis, T. leiboldiana, T. punctulata, and a similar species lacking the dark-violet tones on the leaf blades and having red flower bracts instead of green ones. The flowers are pale-violet in place of dark-violet with a white rim. Huge masses of T. usneoides had broken down many a tree. Vrieseas of various description, Catopsis, and other bromeliads, and orchids live in all the trees. I was sorry I did not have time enough to make an intensive collection. Not very pleasant was the presence of many tree snakes in this region. On some of the trees I climbed with much labor, half a dozen at a time thrust out at me. They seemed in great haste though and left me unscathed. Possibly the movement my climbing imposed on the tree impressed them as an earthquake. I did not see many ground snakes. Once, however, I came upon a clump of more than 100 coral snakes basking in the sun on a sandy riverbank. A grueling sight! T. carlsoniae seems to have two flowering periods: October-November and March-April. This last is probably the regular season, as the plants flowering in autumn never seem to set seed. T. plumosa also has two flowering periods, the number of blooming plants being about equal in both. This does not mean, however, that some plants do not adhere to a normal period. In T. seleriana I noticed that many seeds had germinated right on the mother plant and had grown into a clump as big as a man's fist. 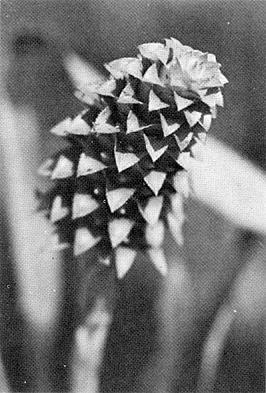 Possibly the drooping position of the seed spike allows moisture to collect in the pods and keeps the seeds from flying off and they sprout sticking to the old plant. Only a few of the seed pods I found had signs of pests. Many of those of T. matudae and T. magnusiana had their contents eaten by maggots. The number of pods on spikes varies greatly. In some species nearly all flowers set seed, while others produce only a few pods, such as in the case of T. multicaulis, T. chaetophylla, T. plumosa, and T. carlsoniae. After three days of rough going on horseback and hard driving over bad roads, it was a great relief to get back on the Pan-American Highway again. A short side trip down to the Pacific Coast rewarded me with T. xerographica, T. rodrigueziana, and a very small bulbous species having entangled leaves and a spike with several ears. By now the car was full of plants of many kinds, and I turned back to Mexico City by way of Tehuantepec and Oaxaca. Before the final stop, though, I intended to comb the ground between Pueblo and Oaxaca and between Mexico City and Acapulco. Some of this area is covered with forest; other sections are prairie-like and dotted with thorny shrubs. This area does not have any true road, only the poorest of trails, but it contains some very interesting Tillandsias. One looks exactly like a T. prodigiosa, except that its flower bracts are much shorter and the flowers are a yellowish-green. There I found for the first time T. circinnata. T. chaetophylla, T. tricolor, and one in between the two, as well as different varieties of T. fasciculata. On a cliff facing south grows a Tillandsia that has a spike branching into 3 to 10 dark-red ears, 30 cm. long, bearing green flowers. The total height of the flowering plants comes to 80 cm. Two other species differ from T. dasyliriifolia only in that they are larger, have larger bracts and flowers of a different color. Meanwhile a fortnight had gone by. I had driven many kilometers by car and had spent three days on horseback. My collection contained about 60 species of Tillandsia, including a number of unidentified ones, various Pitcairnias, Catopsis, and Hechtias, as, well as 38 different species of orchids. I had seeds of 25 different species of Tillandsias. Ahead lay the arduous task of labeling all plants and packing them for shipment to botanic gardens in Germany and neighboring countries. Several months have passed since I returned home. Immediately upon my return I sowed the Tillandsia seeds to check on viability. During the first 2 to 3 months all of them germinated nearly 100 percent. Since then some species have become sterile, while others germinated practically 100 percent after more than six months of storage. My current occupation leaves me little time for excursions, but I hope very much to be able to visit Mexico and Guatemala in 1968 or 1969. �7 Stuttgart-Sonnenberg, Kremmlerstr. 49, West Germany. T IS NOT NECESSARY to travel to Mexico in order to get a good collection of Mexican Tillandsias. Particularly in southern California there are a number of nurserymen who make periodic trips south of the border to keep a stock of these bromeliads always available. The following is a partial list of Tillandsias that have been listed by such nurserymen. There are many more that are available; in fact, there are a large number of stunning varieties that still await identification. All of the Tillandsias given below come from high altitudes�of 6,000 feet or better�thus they want plenty of air movement and a temperature that is not to high. The gray-leaved varieties can take much light and withstand drought if necessary, whereas the soft green-leaved ones need shade and plenty of moisture at all times. All are ideal for fastening on to trees or on to a piece of driftwood. These plants are all highly ornamental and will add to the decor of any patio or garden. In bloom, they make true conversation pieces, and their inflorescences last in color for a considerable period of time. TILLANDSIA ANDRIEUXII � This tiny gem is ideal for bromeliad trees. It has an inflated leaf base with spiraling grey leaves that are black at the base. The bracts are rose, the flowers violet. T. ARGENTEA � This is a true miniature. A gay rose inflorescence bearing bright purple flowers arises from a silvery tuft of slender soft grey leaves. T. BENTHAMIANA � This is a lovely little species with delicate foliage that looks as if it had been sprayed with silver paint. It is velvety to the touch. Delightful long-lasting inflorescence has brilliant pink bracts and greenish yellow flowers. T. BRACHYCAULOS � From numerous stiff, channeled, recurving leaves that turn red at blooming appear purple flowers. T. BULBOSA � This plant is distinguished for its bright green leaves swollen at base and rolled up at slender tips which turn red when the tubular purple flowers are produced. T. BUTZII � The leaves of this attractive bromeliad form an inflated pseudobulb, then narrow into slender spiral wires. The twisted leaves are decorated with purple spots. The bracts are rose, the flowers purple and yellow. T. CARLSONIAE � Silver-gray leaves, approximately one foot in, length, encircle half-dozen rose-colored flower bracts which cluster in the center. Flowers are violet. An unusual and stunning plant. T. CHAETOPHYLLA � From this, gray, grass-like foliage arises a lovely pink inflorescence bearing blue flowers. T. CONCOLOR � This is a small plant with gray leaves forming a stiff rosette. The rose-colored bract produces fuchsia-colored flowers of unusual beauty. T. DASYLIRIIFOLIA � This is a large plant with stiffish blue-grey leaves. The tall slender branched flower spike, sometimes reaching a height of four feet, is of a deep rose shade and bears green flowers. Does not have offshoots. T. DEPPEANA � An outstanding plant with soft green leaves, this Tillandsia has a bright rose inflorescence which sometimes attains a height of three to four feet. An unusual and beautiful specimen. T. FILIFOLIA � The leaves of this small, charming species are so fine as to resemble gray thread. The dainty branched inflorescence has light lavender flowers. Very adaptable as to growing conditions. 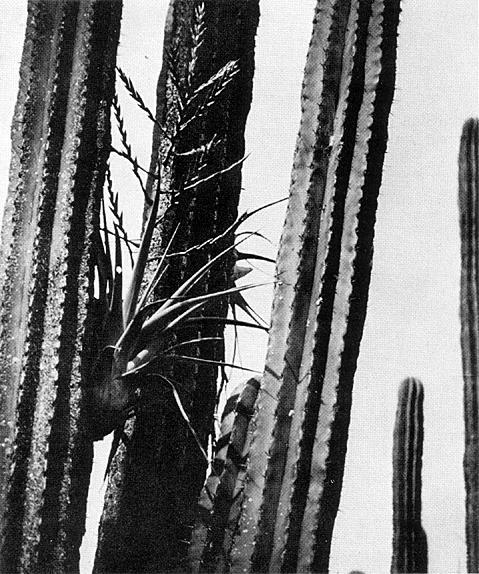 T. FLABELLATA � From a dense rosette of leaves rises a two-foot inflorescence which branches out into spikes, numbering from four to eight, each long, narrowly-flat and suffused with bright red. An outstanding beauty. T. IMPERIALIS � This is truly a regal plant usually in bloom at Christmas. From soft green leaves arises a thick startlingly brilliant red inflorescence, in shape resembling a pine cone. Flowers are purple. T. IONANTHA � To see this little gem in bloom is to fall in love with it. When it starts to flower its silver leaves turn a vivid pink. Flowers are purple. Excellent for mounting. T. KARWINSKYANA � Out of a dense rosette with 20 to 30 leaves comes a lax, wiry stalk bearing a simple, two-ranked spike with glossy green sepals and lilac petals. T. LAMPROPODA � This is a medium-sized plant with heavy, dark green foliage. The red inflorescence is broad and flat; the flowers are yellow. T. LEIBOLDIANA � A small to medium-sized plant with pale green foliage, sometimes dark at the base and speckled with maroon. This is a lovely little plant with its red inflorescence and violet flowers. Suckers freely. T. LUCIDA � This Tillandsia is aptly named, for its beautiful branched inflorescence of an iridescent rose color makes this plant unique. It is a fairly large species with a dense rosette of pale green leaves. T. MULTICAULIS � Known as the "Gold Fish Tillandsia," this bromeliad is remarkable for the fact that it has several inflorescences which rise from between the leaves. The flattened flower heads of shiny orange resemble the inflorescence of a Vriesea. It is a medium-sized plant with soft green leaves. T. PLUMOSA VAR. MAGNUSIANA � This is a dainty tiny species with soft gray leaves that resemble miniature downy feathers. Flowers are green. It is fine for mounting. T. POLYSTACHIA � From a spreading rosette of stiff green leaves arises a stunning rose-colored bract bearing blue flowers. Medium sized. T. PRODIGIOSA � This is a large species with a pendant inflorescence that will measure several feet in length. The inflorescence is variable in coloring and resembles the leis made by the Hawaiians and is used by the Mexican for making into garlands. It is startlingly beautiful. T. PRUINOSA � This is a small species not exceeding five inches in height with leaves swollen at the base to form a bulbous portion. The plant is covered with dense silvery scales, giving it a silvery sheen, which is most attractive. The silvery-scaly covering resembles hoar frost, from which it received its Latin name. Bracts are pink, flowers purple. 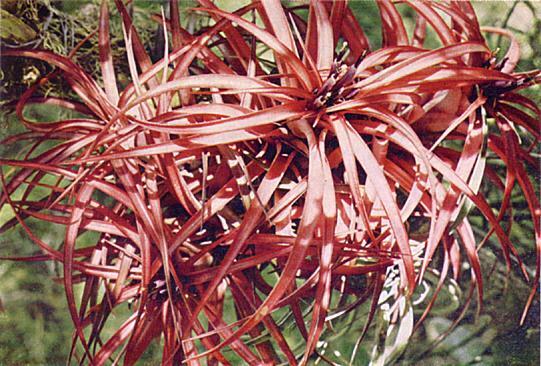 T. PUNCTULATA � From soft, narrow, bright green leaves, chocolate-brown at the base, arises a foot-high flower spike scarlet in coloring, bearing a green crown. Flowers are black with white tips. Unusual. T. SCHIEDEANA � This plant with its stiff, gray, erect, grass-like leaves and its red bract and yellow flowers is especially adapted to mounting on a tree. T. SELERIANA � This is really a "fat" Tillandsia, for its outstanding feature is its thick inflated bulb from which come thin gray-green leaves. From these emerge a bright red branched flower head bearing purple flowers. T. STREPTOPHYLLA � This stunning Tillandsia might aptly be named "Curley Locks" for its silvery gray leaves have a curious habit of twisting and curling. When in bloom, it is particularly gay with its branched flower stalk containing many lavender flowers which appear above delicate pink bracts. T. STROBILIFERA � A large plant with gray-green leaves, brown at the base, is particularly handsome when in bloom with its thick pink spike bearing blue flowers. T. TRICOLOR VAR. MELANOCRATER � This is a six-inch rosette of green leaves with some silvery dotting beneath and black at the base. The branched inflorescence bears tubular purple flowers. T. VIOLACEA � This is a medium sized, green leaved plant of extraordinary beauty when in flower. The flower head, which is pendant, is large and thick of a luminous pink; blooms are blue. Succeeds best when hung on a tree. T. VIRIDIFLORA � A large plant with soft green leaves that are very faintly mottled with a darker green. The tall inflorescence resembles a candelabra with its branches bearing green flowers. T. tricolor with Billbergia � windii used for indoor decoration by M. Lecoufle, France. T. schiedeana makes a good hanging basket subject. N THE AUGUST 1966 ISSUE of Die Orchidee, publication of the German Orchid Society, there appears an article by Dr. Fritz Dungs of Rio de Janeiro, who writes about the mini-code or rather, mini-data. Dr. Dungs stresses the convenience of having imports from foreign countries�that is, wild plants�labeled in a way to indicate conditions under which the plant grows in its natural habitat. He points out that such information should include vital data, but must be sufficiently short not to cause undue embarrassment and to adapt to the principal languages. � Temperature requirements, W for warm, K for cold. The author does not say whether the code is his invention. He goes to lengthy and to-the-point explanations of why it is good to have the data and that it is important that they be universally understandable. He adds that the code as presented may be considered to be a basic structure to which further information can be added if required. 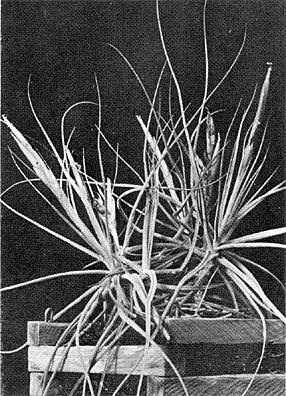 As a sequence to this article the editor Die Orchidee published the comments of Dr. G. F. G. Pabst, botanist at the Herbarium Bradeanum, Rio de Janeiro, enhancing the desirability that all collectors of plants adopt a simple common code along the lines exposed for their plant material. It would facilitate work and save time in identification for all concerned. ECAUSE SPACE IS SO DEFINITELY a limiting factor and my interest so wide, not only in bromels, but in succulents as well, I have to choose my bromeliads with care. Unfortunately, I do not have a greenhouse and the plants can only safely be in the lath house from about mid-May to mid-September. Even between those dates, the temperature can drop unnervingly low at night. We have had minus 15 degrees at times in mid-winter. The rest of the year the plants live in a large airy sun-room with floor to ceiling windows on the east, south, and west sides. If the plants look well, it is largely due to daily tender loving care. Even then the lack of overhead light for so many months of the year limits the plants one can grow well. Just to say one has such and such a plant, even though it has none of the characteristics of the type plant, does not interest me at all. Hence most of the colorful and interestingly shaped Billbergias are "out." Indoors they turn to pure grass. The same is true for some of the hard-leafed Aechmeas. They do not go completely to pieces, as do the Billbergias, but the leaves do tend to get attenuated and droop more that they should. Following a hint from one of the members, I am going to try keeping the Billbergias and Aechmeas I have almost bone-dry at the roots next winter and see if things improve. The plants that are turning out to be sheer delight are the smaller Neoregelias, all of the Guzmanias, most of the Nidulariums, and, of course, all of the Vrieseas, especially the small ones. The Neoregelias, now that I have learned how to treat them, are especially rewarding because for a long time they were disappointing. I know the book says they want part shade, but not in this latitude. Here they want all the sun one can manage for them except in mid-day in mid-summer, when they will take the very thinnest of shade from a locust tree. From September to May they hang right against the glass in the south windows. Then they stay compact and brilliantly colored. Neo. ampullacea var. tigrina is so deeply maroon, it is almost cordovan colored. I do not have room for many of the larger bromels and have just a select few. However, I would hate to have to part with Vriesea imperialis or V. gigantea or Aechmea coelestis var. 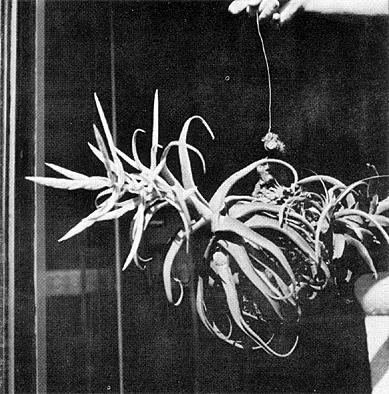 albo-marinata or Guzmania lindenii. I thought the same thing about Aechmea bromeliifolia as a first generation plant, but if the offsets do not start looking more as they should than they do now, they will join the discards. Hohenbergia ridleyi is really suitable only as a garden subject and is not worth bench indoors. I would be delighted to have any members of the Society visit us at any time of the year (remembering that we were snowed in for four days last winter), as long as they make sure we are at home. The place is only 12 miles north of the Pennsylvania Turnpike, at Fort Washington interchange, which is about 25 miles west of the Pennsylvania-New Jersey border. Telephone is 215-822-2086. In addition to broms we have a collection of succulents, a 100-foot perennial border, an iris garden, a collection of hemerocallis, and rock garden. In all, we have seven acres to work with. �2828 Line Lexington Rd., Hatfield, Pennsylvania. 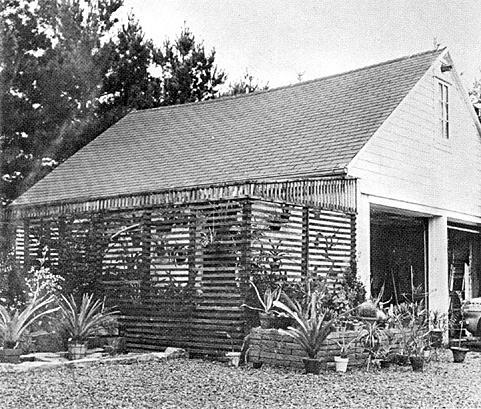 Lath House of Paul Whippo, in which he raises plants to exhibit at flower shows. In the Bromeliad Society Bulletin, Vol. XVI, No. 5, on page 110, you had an article on algae control. In this article you mention the use of quaternary ammonium compounds. A bit over two years ago, I first became aware of "quats," as I had occasion to use them in my work. It worked so well that I carried their use over into my hobby growing tropical plants. For the last two years I have been using a multiple quaternary (Consan 20) for algae control with quite satisfactory results. To control algae in my greenhouse, I spray everything (twice a year), glass, wooden frame, benches, and floor with a 400 ppm active ingredients (1� tsp. to a gallon of water). I remove all plants before this treatment. In between these sprayings I spray again with a 200 ppm solution. At these times I do not remove the plants. Now my greenhouse stays free of algae. All of my clay pots are soaked at 400 ppm for about 30 minutes before use. They stay algae free 2 to 3 times longer than untreated pots. Phyto-Hygiene is what I like to call the program I have been working out for my greenhouse to keep disease and pest out of my plants before they can get a start. As part of my program, I am testing quats for the control and prevention of plant diseases. So far the tests look quite good. I am finding that a Phyto-Hygiene program is giving me healthier and more vigorous plants, which reward me with beauty and color for the time and money expended. �R. D. Magor, 2644 Olive St., Huntington Park, Calif. 90255. One day I took the top off a pineapple which my wife had bought at a local A. & P. store, cutting it off at a depth of about one-half inch of the fleshy or meat part. I put this in a dish of water, changing the water every few days. After the roots had formed, I put the pineapple top in an eight-inch pot, containing good leaf mold soil. As the plant increased in size, I changed the size of the pot until the pot measured 14 inches in diameter and about 14 inches in depth. When the plant was about seven months old, I dropped a few pellets of granular carbide into the center of the cup. Although I had drained the plant of all moisture, there was enough left that there was some violent action as the carbide changed into the gaseous state. At the time I wondered whether I had burned the center out of the plant but three or four months later, the center began to turn the pretty red that pineapples do before fruiting. Today there is a pineapple standing up about eight inches above the center of the cup. The pineapple itself is about four inches long and about three inches in diameter. I regret that I did not weigh the carbide grains, but I would say that I put in probably not more than three pieces no larger than about 1/8 inch and certainly not as big as 1/4 inch each. �G. M. Gerlach, 341 Duperier Ave., New Iberia, La. The most often asked question at this nursery is "How long will it be before I have to change the pot to a larger size and then what potmix will I use." This, of course, refers to the growing of a bromeliad. For the answer to this question, we have a special plant to show the customer. It is an Aechmea fasciata, growing in an eight-inch pot. It has eleven leads all intact with many new offshoots appearing. From this plant this year, five spikes appeared, leaving six still to flower. The whole thing is cumbersome and overbalanced, but for the purpose it serves this does not matter; it serves to demonstrate that this root-bound plant does not worry a bit. It is an entirely different matter with young plants�nothing short of a five-inch pot is really right to plant well-grown seedlings into. To prove this point, after many disappointments after using thumb pots, we set out to prove the matter. Vriesea platynema was chosen to experiment with, as this plant is hardy and grows well. Some seedlings were planted in pots ranging from 2 inches to 6 inches. After five years, things really happened, and one could scarcely believe that these plants all came from the same batch of seedlings. Those broms planted in thumbs had scarcely moved, while progressively the larger pot, the better the plant, until the one in the 6-inch pot was a large plant with a spreading about 16 inches across. All shared the same condition and potmix of tree fern fiber and all were in plastic pots. We believe that the main fault in the smaller pots was the confined area and the consequent lack of good drainage. The root system in the largest plants was typically that of most Vrieseas; i.e. not very large, but the area in which it was grown was more friable and open and the potmix did not tend to sogginess. If we had to choose between plastic pots and earthenware pots, the latter would win easily because of the porous nature of the walls; but the convenience of using plastic pots overrules all, providing the size is right as demonstrated above. �W. B. Charley, Mt. Tomah, Bilpin, N. S. W., Australia. We all know that watering, conditions under which they are grown, and other factors all play a large part in the coloring of bromeliads. Another thing is starvation. The writer has proved this. Last year two plants were repotted at the same time and put back in the same positions in which they had always been. Prior to repotting both were highly colored and had been for all of two years. After repotting they gradually lost most of their color. In fact, one went back to green. When the plants were first taken out of their pots, they were found to be pot bound with very little mix left in the pots at all. The new mix was the same as used for other broms. It was not a rich one. However, color went, and now the plants are not nearly so interesting as they were. It would be worthwhile to try some experiments along these lines and see what turns up. Have any other members had experience similar to this with their plants? If so, let's hear. �F. 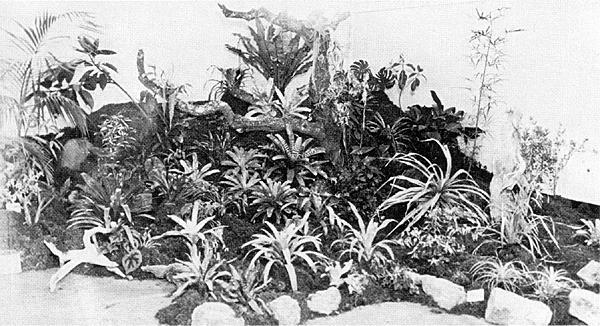 B. H. from Bromeliad Society of New Zealand News and Views. Small-sized bromeliads are particularly desired by those who must cultivate under glass and where space must be of concern, but such cultivation precludes the growing of many choice items of greater bulk. Though admittedly the common form of Guzmania zahnii is a treasure, it is but a pale imitation of the large, robust form whose leaf spread approaches four feet. Fortunately the foliage is soft and pliable and not so space demanding as rigid-leaved plants. Seeing the large form is certainly startling. It retains all the elegance, quality, and beauty of the standard variety. It is not so dainty as the latter, but is a noble plant, and the longer leaves drooping at the tips gives added grace. It is a full-foliaged plant, brandishing a feather-duster assemblage of 75 leaves. Spotting the plant at Hummel's Exotic Gardens, I was overcome with greed, which was promptly regretted upon placement of the plant in my collection and noting the amount of space occupied. However, with the approach of flowering all regret was dissipated, for this plant assuredly packs a greater wallop than does the typical form. There is more of everything�more foliage; more extensive copper‑red flushing: more of the distinctive red linear markings, its principal glory; and more to the inflorescence, which rises to two feet and consists of 25 or so clusters, each of which is as large as the flower head of the regular variety. These are of the same distinctive shade of yellow as the others. As would be expected, one can restrict the size by growing the plant in an under-sized pot. This robust form is to be found on the Pacific slopes of Central America. The usual form comes from the Caribbean side of Central American and Venezuela and Colombia. Cultural treatment for both plants is identical, which is to say they appear to prosper best in osmunda. �William T. Drysdale, 4300 Isabella, Riverside 1, Calif. Despite the difficulties being experienced by those living in Rhodesia, gardens, garden clubs, and garden shows are still an important part of the lives of many Rhodesians. The above photo shows a bromeliad display entered at a recent show in Salisbury. All the plants were those of Mrs. Sue McCormick, many of which she had raised from seed. On January 18 the Louisiana Bromeliad Society held its inaugural dinner introducing its new officers. These include Mrs. William B. Wisdon, president, Mr. Luke Cuccia, vice-president, Mr. Irwin Poche, Jr., treasurer, and Mr. William Fahey, secretary. Also installed at a special banquet for the occasion were the officers of the San Mateo County Bromeliad Society. Those who will serve during 1967 are Doris Beaumont as president, Clara Christensen as vice-president, Anna Peters as recording secretary, Graham K. Bromfield as corresponding secretary, and Kurt Peters as treasurer. A number of bromeliad study groups are making their appearance�in San Francisco, in San Diego, in Texas, in England. It is hoped that these fledglings will soon become affiliated. Under the able leadership of Dr. J. G. Milstein, the members of the New York City affiliate are busily planning their exhibit for the big flower show to be held this spring. News from New Zealand discloses that there is no more active affiliated group than those living down-under. Our congratulations go to these members who live so for from the source of supply of these all-American plants. ROMELIADS AND ORCHIDS are becoming serious rivals for the time and attention of many gardeners. David Barry, Jr. 's article "Bromeliads in Hawaii" in The Bromeliad Society Bulletin, Vol. XVI, No. 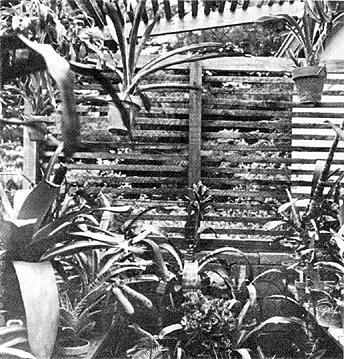 4, July-August, 1966, notes that the Goodale Moirs, Hawaiian orchidists of long standing, are busily replacing orchids with bromeliads in their extensive gardens in the Nuuanu Valley, Oahu. In my own experience bromeliads are steadily encroaching on the orchids in the shade-house. The relative rapid growth to maturity of bromels, as compared with orchids, and the ease of propagation both by offsets and by seed, give these plants an undeniable advantage over orchids. The fact that the transition from orchids to bromeliads is accomplished so easily is an indication that the requirements of these plants are very nearly the same. Are bromeliads and orchids complementary to each other? Is it wise to grow them on the same greenhouse bench? The same plant food in solution may be used for both classes of plants, and in most instances the light, humidity, and watering requirements are practically the same. One area where incompatibility may exist is in the spray materials used to control insects and diseases. Some of the spray materials used for orchid pest control may prove harmful to bromeliads, especially if they are permitted to accumulate in the centers of the bromeliads. The obvious answer is to keep bromels and orchids on separate benches in the greenhouse or slathouse. In many greenhouses, bromels, like stepchildren, have fallen heir to the cast-off potting materials from their more regal monocotyledonous relatives, the orchids. Most bromels, unlike the more demanding orchids, grow well in used osmunda and second-hand tree-fern fiber, not that they would not be eminently more successful if potted in new materials. And it would be foolhardy to risk potting rare and expensive bromeliads in anything but fresh materials. Further comparing bromels with orchids, we can easily see that even the plain green or plain gray unflowered bromels present a year-round symmetry of form, which orchids most decidedly do not. When to this pleasing form are added bands, blotches, spots, and leaf-tips of diverse colors that are present on the leaves of many species and hybrids, we have plants distinguished by a rare beauty not to be found in many members of the plant kingdom. On the other hand, only well-grown orchid plants can be considered presentable when not in flower; and among the orchids only the mottled leaved Cypripediums and the small group called the "jewel orchids" possess the variegated leaves that create year-round interest. In all the world, bromels are found only in the southern portion of North America, in Central America, and in South America, whereas orchids have a nearly world-wide distribution. 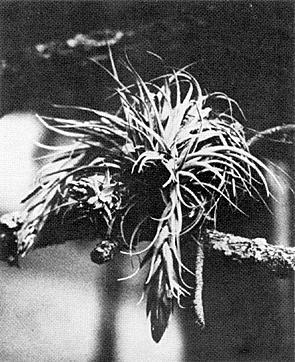 In their sphere of co-existence, bromels appear to be more successful in adapting to trying conditions than do orchids. Their xerophytic representatives have ventured into and become established in wastelands and nearly desert regions as terrestrial plants, while there is no comparable invasion of such territory by either epiphytic or terrestrial orchids. Will bromeliads gradually displace orchids in their epiphytic sphere of competition in Central and South America and the West Indies? Where they are both present on the same limbs of trees, the chances are that the bromels will be more robustly aggressive and more inclined to overgrow and overshadow the slower growing orchids. Among the bromel's assets are their own rain-cisterns in the tank types; hygroscopic scales, with which moisture is literally snatched from the air; protective, often fearsome spines; and prolific reproduction by offsets as well as by seeds. And what do orchids have? 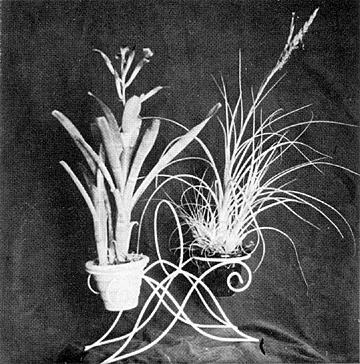 Leathery, fleshy leaves, and often pseudobulbs, actually swollen stems, to store water; aerial roots uniquely protected by a covering of velamen; and weirdly zygomorphic flowers adapted to and heavily dependent on mentomophily. These highly developed of all floral forms have fringed, frilled and flared lips, hairy pouches to trap pollinators, spurred nectaries, and an infinite number of floral triggering mechanisms, all of them involving interplay with highly selected and selective insects. Over-specialization of floral parts may well spell doomsday for those orchid species whose insect pollinators are decimated or exterminated by disease or parasitism or by man. �P. O. Box 969, Sebring Florida. This is the most complete handbook on bromeliads in English, containing 125 pages of text, 50 illustrations in color, and many photos in black and white. All articles are written by experts in the field. Specific bulletins are not always available. If you desire a certain copy, please write to see whether it is still in print. All issues of No. 1 are scarce. There are no individual copies of any bulletins prior to Vol. VI. The Bromeliad Society has a limited number of copies for sale of the Missouri Botanical Garden Bulletin, Issue No. 1 for 1967, which is devoted entirely to bromeliads. It is written by Lad Cutak. Price 60 cents. All orders should include check made out to The Bromeliad Society and sent to the Office of the Editor, 647 South Saltair Avenue, Los Angeles, California 90049. Please note that no publication will be sent unless check is first received. Tillandsia brachycaulos does not merely blush when it comes into bloom, but turns red all over�a phenomenon which indeed makes it a spectacular little bromel. The color lasts for a considerable period of time. A hardy xerophytic, T. brachycaulos is to be found growing in dry woods at an elevation from 1000 to over 6000 feet in southern Mexico and in Central America. It is perfectly hardy in sub-tropical gardens. This bromeliad has gone by several names since it was first introduced in 1844. having been called T. cryptantha by Baker and T. flammea by Mez. It is known in Yucatan by the Maya name "miz," "chu," and "mexnuxib." The stiff grayish recurved leaves �-inch wide to 10 inches long form a rosette 6 inches high. The purple flowers�about 12 of them�nestle deep in the heart of the leaves. The above photograph was taken by Marie Wood of a plant growing on a native oak in her garden in southern Florida.